Place 1 cup water, mirin, and shoyu in a bowl and mix. Bring 2 cups water to a boil, add the spinach and cook 1 to 2 minutes. Place in a colander, rinse under cold water to set the color and drain. Squeeze excess liquid from spinach with your hands. Place the spinach in a shallow casserole dish and pour the mirin and shoyu marinade over. Let marinate for 30 minutes, mixing occasionally to evenly marinate. 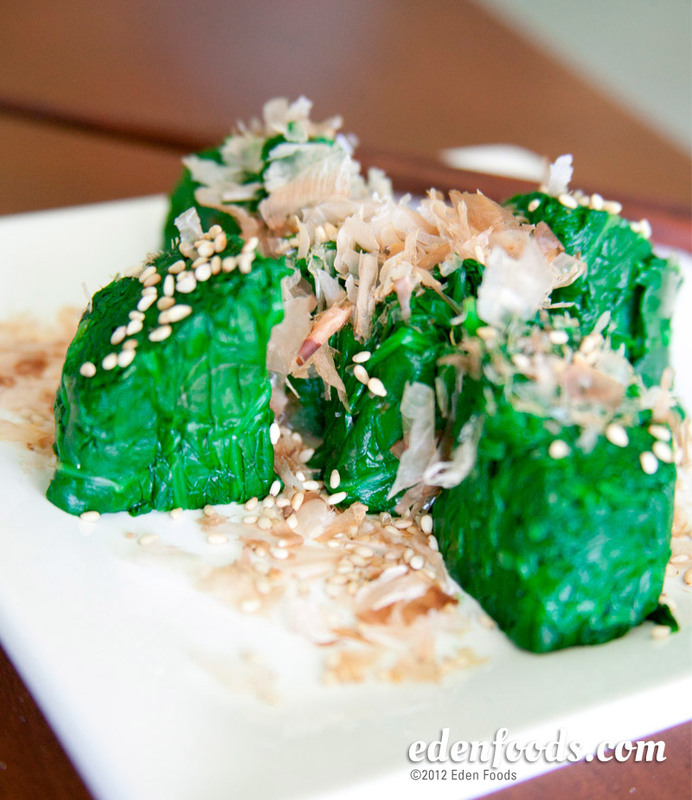 Place marinated spinach on top of a sushi mat. Wrap the mat completely around the spinach, and squeeze to remove excess liquid. Remove the mat and slice the spinach in 1 inch long sections. Place the spinach on a serving platter with the cut surface facing up like sushi. Garnish with crumbled bonito flakes, if desired, and Eden Shake.